Want a small inexpensive purple ribbon but don't want a metal lapel pin or hand made ribbon with a safety pin? This might be your solution. Buy these Purple Cause Awareness Ribbon Embroidered Stick ons. This embroidered awareness ribbon sticker is an excellent item for promoting "purple" cause awareness and education. The self-adhesive "stick-on" backing enables you to place this applique on name badges, shirts, jackets, uniforms, bags, helmets and backpacks. The appliques are a terrific give-away at health fairs, conventions, breast cancer walks, funerals, and especially fundraisers. 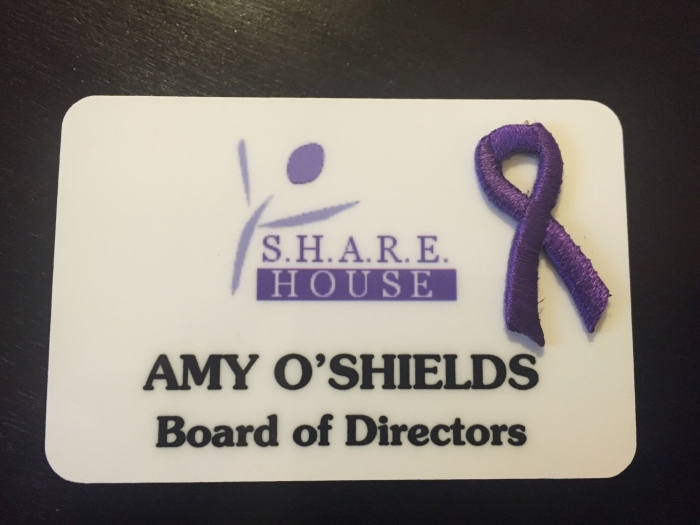 Each sheet has 25 peel off purple ribbons, each individual ribbon is 3/4" x 1 1/4". That works out to 40 cents each or less in quantity. Great addition to our name badge! This is the perfect size for our name badges and looks great! Excellent product and rapid delivery. These are good quality and I will enjoy sharing them with people. Merchant Response:Oh no! That's not what we like to hear and that's not how our product normally arrives. We will send you a new set pronto! These were a gift for a friend of mine who is a 6 year pancreatic cancer survivor. Best UsesThese are great to decorate a plain vase or bowl for any cancer event.